Cathy's Cuffs Black Blindfold is made from opaque nylon with two elastic bands to keep it comfortably in place, covering your eyes completely during fantasy play. The best fantasies are with your eyes covered. What will your lover do next? The anticipation heightens your senses and builds arousal. Also a great sleep shade. Blindfolds or masks are sensory toys. When one of the senses are removed those remaining become heightened. 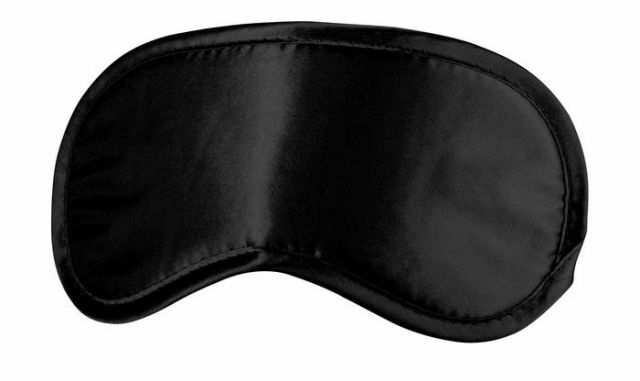 The blindfold wearer will have a heightened sense of smell, touch and hearing. There is also a heightened sense of anticipation and suspense which can substantially increase the userÂ’s pleasure and satisfaction. One size fits most. Cathy's Cuffs Cathy's Blindfold Black by Fantasy World Products. Cathy's Cuffs 20 years of making the finest restraints and accessories. Made in the USA.